I couldn’t quite take the picture in time. 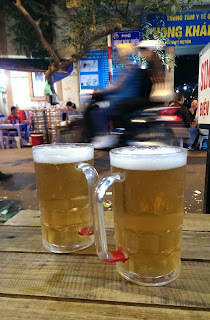 I saw it, fumbled to unlock my phone, fingers sticky from street food, and I tapped the camera icon, but the scooter carrying five silver kegs was already weaving through Hanoi’s never-ending traffic. As we follow in the same direction I’m soon distracted. There are people everywhere, everything moves so fast, life condensed into the packed, stacked, compact streets; the air is thick with the smell of bubbling stock pots, an aniseed edge to every inhale coming from all the herbs, tropical fruit adding a fragrant sticky warmth; every turn reveals something new, something I’ve never seen before. Like Bia Hoi Corner. This famous intersection of bars has battered old beer kegs lined up on the kerb, people run around with trays of glasses, trays of fried food, the scooters weave in and out of all of it, and hundreds of people sit outside on tiny plastic stools, a dozen different languages bouncing around. It’s one of the world’s most exciting and lively places to drink, where the local beer, bia hoi, is unlike any other lager you’ll have had before. 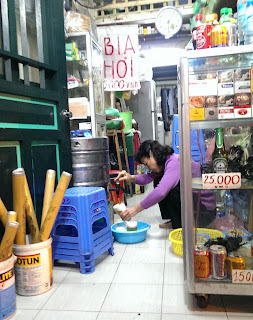 Bia hoi essentially means draft beer, the ‘bia’ bit derivate from the French ‘bière’, and it’s a pale lager, somewhere between 3%-4% ABV, brewed with malt and rice. That part is fairly normal for Asia. What makes it different is that after fermentation, at the point where lagers usually undergo an extended conditioning period, bia hoi is kegged and sent to bars. It’s fresh beer, a few days old, unfiltered and unpasteurised, with barrels delivered to bars every morning and emptied within a day, all served and drunk on the side of the street. 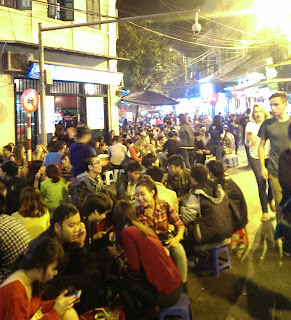 And that busy street-side experience is remarkable. 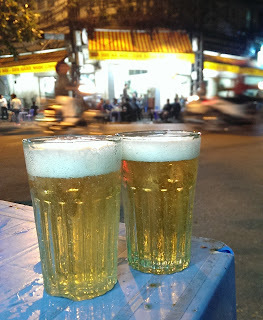 When you sit on those plastic stools, knees under your chin, with your feet in the road, you’re given a tumbler, sometimes glass, sometimes plastic, of pale lager, and it’s something wonderfully simple in the middle of the madness. Bia hoi has the light, clean essence of Asian rice lager, made lighter by being low in alcohol and lacking depth because of its youth, the same youth which brings fruity esters of banana and strawberry. You also often taste the kind of caramel and buttery sweetness of Czech lager, reflecting the Czech influence on beer here (something surprisingly prevalent, especially so in Hanoi’s many brewpubs). The best bia hoi are really fine glasses of refreshingly bitter beer; the less-good ones aren’t worth worrying about when you’ve only spent 10p on it – it's one of the cheapest beers in the world. While the liquid itself might be simple, understanding it is less so. 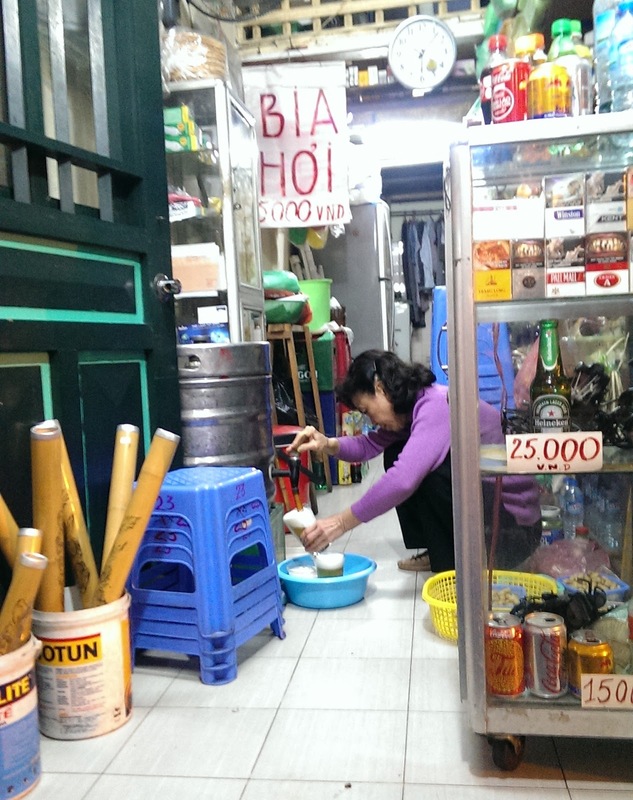 All bia hoi is a bit different and the quality ranges. Different breweries make it (most big, some small), kegs change taste through the day, it changes depending on where you drink it, some bars have large drums of beer, others just tilt kegs on the roadside with barely any bar to house it; sometimes it cold, other times barely cool, some are great, others are ok, plus you never know who makes what you’re drinking because it’s free of branding; it’s just bia hoi, draft beer. This is Vietnam’s beer and drinking it in Hanoi is a rare and wonderful experience. Nowhere makes or serves beer in this way, a fast-brewed, very fresh beer, kegs opened and emptied in one day before another delivery comes the next morning, where you drink on the street and the simplicity of the beer is the best kind of counter to the craziness of life flying by around you. It’s worth knowing that you can also get draft beer that isn’t bia hoi – this is regular kegged lager from the local breweries, so if you specifically want bia hoi then you have to order that. And my favourite place to drink bia hoi wasn’t on Bia Hoi Corner, it was on the corner of Bat Dan and Duong Thanh (the top picture is the place) – lovely and bitter beer, in a place filled with locals eating good cheap food. 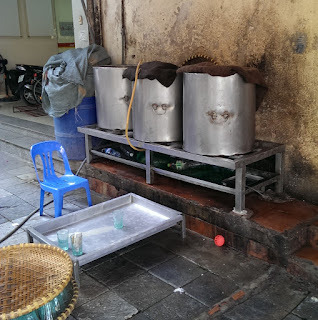 There was also a place opposite (the one with the big 100-litre drums in the picture above) which was good. I imagine that must make accurate Untappd updates difficult. How do people cope?